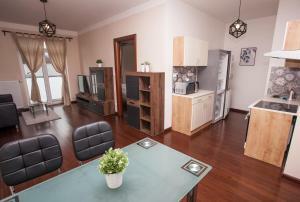 It’s very clean apartment and secure with great facilities like swimming pool, gym and sona room. It’s located in quite area with 100-200 mtrs two playgrounds for kids. There is also a nice shopping mall near the complex . The appartment was really nice. Good view, clean, nice furniture. Location was pretty good, a few bus stops away from the centre. I didn't expect such a beautiful time in Chech in general and in Karlovy Vary in particular. If you are traveling by car, highly recommend a trip to Marien Bad. Amazing places. Brand new condos at very affordable price walking distance to DT KV. And walking distance to grocery stores. This place was actually really nice. Our kids loved the pool and sauna after a long day of driving and seeing the city. The bed was comfortable and the bathroom was huge!! We didn’t use the kitchen, but it would have been perfect for a longer stay. It is a little out of the touristy part of the city but it didn’t effect us as we had a car. We have an suv and their parking lot fit it perfectly. Parking was 4€ a day. Nice modern apartments, clean and safe. Rooms were spacious, kitchen well equipped, as a bonus pool and sauna and gym. Particularly spa facilities were reason why we decided for this accommodation since we had kids with us and it was good fun for them. Nice full equipped apartments. Nice swimming pool and gym. Very easy to check in, chatty receptionist Natalia told us everything about the city and surrounding. Apartments in a very quiet location, good quality sleep, nice to have a swimming pool at the property. Lock in a great price for Rezidence Moser Apartments – rated 9 by recent guests! One of our best sellers in Karlovy Vary! Located in Karlovy Vary, Rezidence Moser Apartments is 1.9 mi from Mill Colonnade. Market Colonnade is 1.9 mi away. Free WiFi is provided . The apartments feature a satellite flat-screen TV. There is also a kitchenette, equipped with an oven and fridge. Each unit is fitted with a private bathroom with a hairdryer. The apartment offers private parking on-site. Rezidence Moser Apartments also includes a spa center with 2 saunas, a swimming pool and a fitness center, all included in the room rate. A spa bath is available for a surcharge. Meal plan can be arranged upon arrival and for a surcharge. You can engage in various activities, such as cycling and hiking. Hot Spring is 2 mi from Rezidence Moser Apartments, while Moser Glass Works is 650 feet from the property. The nearest airport is Karlovy Vary International Airport, 3.7 mi from Rezidence Moser Apartments. When would you like to stay at Rezidence Moser Apartments? This apartment has a kitchenware, electric kettle and soundproofing. This apartment has a seating area, microwave and private pool. This apartment features a kitchenette, stovetop and soundproofing. Prostorné moderní ubytování vhodné pro všechny druhy pobytů. Velkou výhodou je možnost využít wellness centrum přímo v domě. Wellness obsahuje bazén a dvě sauny. House Rules Rezidence Moser Apartments takes special requests – add in the next step! Rezidence Moser Apartments accepts these cards and reserves the right to temporarily hold an amount prior to arrival. Please note that the swimming pool is open daily from 9:00 till 20:00. 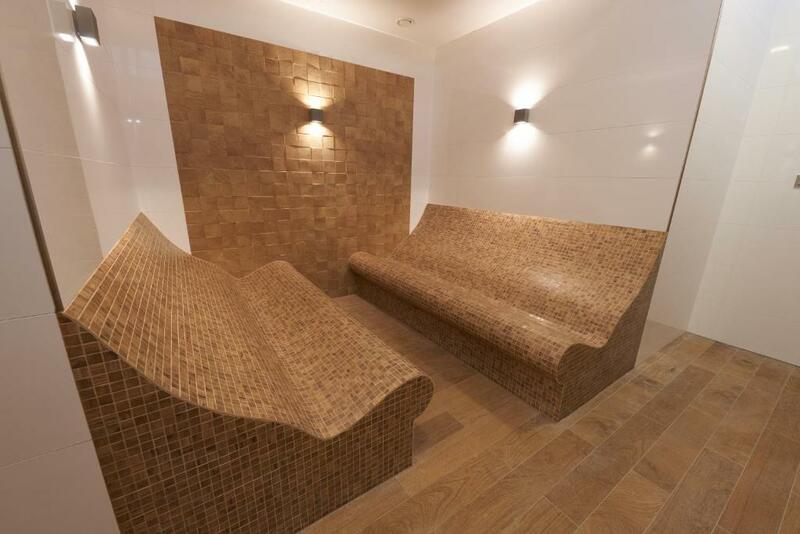 The sauna is available from 17:00 till 20:00 or upon prior reservation at the front desk. Please inform Rezidence Moser Apartments of your expected arrival time in advance. You can use the Special Requests box when booking, or contact the property directly using the contact details in your confirmation. Sauna was not turned on on Friday evening in time when it should work. Parking might be for free and it didn't make sense to pay for it because there are plenty of free parking outside the property just across the street. Otherwise everything was alright. Far from the center of Karlovy Vary. No probem if you travel by car. Parking gate is broken or just always open, but the area looks secure enought. Wish we had more pots and pans, seems some are missing as the lids were there but no matching pans. it was a bit cold in the building and in the room itself too. There was a draught between our room and the hallway. Other than that, the place is great. The room was so cold. I called several times the reception but the staff can't speak English. The location, and facilities are good. it was very spacious apartment, clean, nice swimming pool. Apartment was spacious and had everything we needed. The kitchen/cooking utensils should be updated. In the room for 5 adults there were no cooking pot and frying pan of an appropriate size. The available items should be reviewed against quantity / aging / life-expiration more frequently. Convenient and easy-to-reach location. Many transport possibilities, car parking is available. Great price/comfort ratio. We have been already the third time there and will definitely return again. Jacuzzi is available at the site, but only for private use and probably for additional money. Minor maintenance required - Light bulbs in some rooms didn't work but moving the table lamps around helped out. Small touches like providing salt & pepper would be appreciated too. But these are just minor things, overall stay was still great! The facility - Gym, sauna, swimming pool, locker rooms etc. Kids loved it, they were full time in the pool and wasn't crowded with guest much either. The apartment itself was very cozy and well furnished. Liked that they had 24/7 reception, that too for an apartment complex - quite unusual. Overall, loved it!